FUN HALLOWEEN POCKET LETTER I MADE USING SPELLBINDERS SMALL DIE OF THE MONTH DIE CUTS AND SOME OTHER DIES FROM ALI EXPRESS. I ALSO MADE THESE CUTE TAGS USING THE WE R MEMORY KEEPERS FLIP OVER TAG SET. I PUT SOME GLASSINE BAGS INSIDE FILLED WITH SOE DIE CUTS FOR MY SWAP PARTNER. 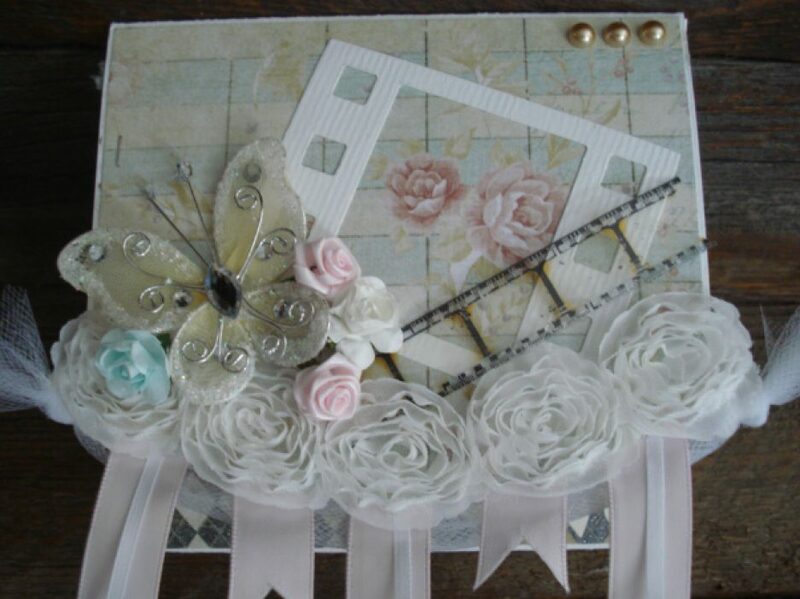 My first project using the small die of the month dies from Spellbinders was this sort of shabby chic card. I used one of the frame dies to cut out the brown piece of card stock and layered it on top of another spellbinders die that I had in my stash. I cut out the birds and flower from light pink felt and layered them on top. I added a little bling for the birds eyes and the flower centers. I layered that all on top of another piece of patterned paper from Prima and then mounted that on a brown card base. My next project I made a book mark from some pretty patterned paper in the long tag shape from Elizabeth Crafts die set. I cut out some more of the birds and the small flourishes that are from the Spellbinders set with gold foil paper and mounted them length wise on the tag and then I cut one of the other frames from the set in a coordinating patterned paper and mounted it cross ways on the tag and topped it off with the Love word punch from Teresa Collins. I added a gold hole reinforcer on the top and then ran the whole thing through my laminator and then cut out around the shape and tied some bakers twine on the top. I think they both turned out pretty cute. You can do a lot of things with dies that come in the set. Thanks for stopping by. Another project using the Spellbinders small die of the month May 2018 set. I made this tag card using the Celebrate word from the die set. I cut the tag from some patterned paper from Crate paper and some chipboard and layered them together for strength. I tied a piece of ribbon on top to hang the tag. I layered some die cuts, including the celebrate word cut on top of the pink circle. Then I applied some Nuvo drops in lemon yellow to finish off the card. I also add a gift card pocket from Lawn Fawn onto the back of the tag so I would have a place to hold a gift card. I can just insert this whole tag into an envelope and deliver it like that or I could tie it to a gift. By the way I did a process video on this but some how messed it up and didn’t get it uploaded properly. I’ll do better next time. Thanks for visiting and if you haven’t done so yet hit the subscribe button for notifications of future blog posts. If you have any questions leave them in the comment section below and I will get back to you. #NeverStopMaking Spellbinders small die of the month set. I made this rainbow card using the Hello die from the set and I think it turned out so pretty. It was very easy to make. I die cut the hello from each of the rainbow of colors of card stock and then staggered them onto a piece of white card stock. I then stamped a sentiment from Simon Says Stamp Best Ever stamp set and heat embossed it with white embossing powder. I trimmed out the sentiment and then adhered it to the top Hello strip. I finished it off with just a little bit of embellishments because I felt that there was already enough going on with all the color strips, so I adhered some clear sequins from Simon Says Stamp. These dies could be used in so many ways the possibilities are endless. Hope you enjoyed, leave me a comment if you have any questions and please subscribe if you haven’t already done so. Love using die cuts to make cards. I used some silver foil card stock to die cut these from the Spellbinders Oval Ironworks die set. I layered them using foam tape and stamped a sentiment with black ink on the inside oval. I added gems in the four spots and then tied some silver ribbon in a bow to the top of the card. As a finishing touch I adhered a black and white striped butterfly to the bottom left section of the card. I adhered all the elements onto a top folding white card base that measure 4.25 by 5.5. So simple but so gorgeous. Another card made using the January card kit from #SimonSaysStamp. This time I also used my new die from #spellbinders #NeverStopMaking I love the die cut as a stand alone or as an inlay as I used it here.